I had bonding done on my four front teeth almost 20 years ago to cover tetracycline stains. One chipped and I returned to my same general dentist to request veneers on the six front teeth as the solution. Instead, he talked me into six crowns, saying that they would last longer, serve as a better solution to the staining, and also help address my gummy smile. Foolishly, I listened without doing my homework, as I wanted the situation quickly corrected and he is a very reputable general dentist – not to mention a long-time family acquaintance. I trusted him. He is known as the best in the area. Unfortunately, there is grey visible beneath a few of these luminescent crowns—and especially so in fluorescent light. I am horrified. He has said he will make it right and have the lab redo the problematic ones free of charge. However, I am now very concerned and thinking the better course of action might be to request a full refund and see a true cosmetic dentist. I think he is in over his head, despite trying to reassure me he does this work all the time. I am now always going to be stuck with crowns versus my real teeth for the rest of my life and I am just sick about it. I think I would be justified in asking for a refund and entrust a re-do of the crowns to someone else. Your thoughts? This is tough, when you have a family acquaintance and supposedly reputable general dentist who seems to have little clue as to how difficult a procedure he has bitten off, probably with the best of intentions, but now you are suffering because of it. 1. For lack of comfort with the porcelain veneers procedure, he recommended the highly aggressive porcelain crowns to fix your front teeth. And now that your teeth are ground down to stubs with crowns, there is no going back. 2. Based on the dental school mentality that there are six front teeth and the rest are back teeth, he tried to correct a very dark tetracycline-stained smile with fixing only six teeth. An excellent cosmetic dentist, in doing a smile makeover of dark teeth, will always include at least 8, maybe 10 or 12 teeth, depending on the width of the smile. Dental schools speak of anterior teeth and posterior teeth. Cosmetic dentists talk about the patient having 8 to 12 teeth in the “aesthetic zone.” Here’s a photograph of a patient with only six crowns on a background of dark teeth, but her smile is 10 teeth wide. The failure to cover all teeth in the aesthetic zone makes it obvious that this patient has crowns. 3. For lack of familiarity with the intense color issues involved in tetracycline stains, he didn’t adequately cover the teeth, and the dark color is showing through. So should you let him go back and fix this now? Absolutely not. It’s likely that even his lab doesn’t know what they are doing. Tetracycline stains are one of the most difficult cosmetic dentistry procedures, and you need an experienced professional. You’re in Philadelphia. We have several excellent cosmetic dentists in the area that I recommend, in downtown, the suburbs, and nearby. Being a trusted, reputable dentist, he would probably be willing to give you your refund, and I would ask for it. Done right, you could have a truly beautiful smile. And then you could go back to him for your general dentistry needs. What are the different types of teeth stains? Can you please explain endogenous vs exogenous stains? Intrinsic vs extrinsic stains? What terms would a dental assistant hear more and which should they be familiar with? I appreciate your help. This sounds like something that must have come up in connection with a textbook or a classroom discussion (I see your email address is from a college). That’s not the primary function of this blog, but your question is interesting and I’d like to help you out. The terms you are using are those that would be used by academics and not so much by practicing cosmetic dentists. But they are a useful way to categorize teeth stains. Of the terms you mentioned, extrinsic and intrinsic would probably be heard more often clinically among practicing dentists than endogenous and exogenous. Extrinsic stains would be those that exist on the surface of the teeth. Tobacco creates extrinsic stains. Here’s a picture of some teeth with extrinsic stains. These are child’s teeth, and children, as their teeth are developing, tend to pick up some of these stains as different naturally-occuring bacteria come to populate their mouths. Peridex mouthwash causes this type of stain. The milder stains of this type can be removed by brushing (e.g. whitening toothpastes). The more stubborn ones will need to be removed by a dental cleaning, or by Supersmile toothpaste. Intrinsic stains would be those that are absorbed into the actual structure of the teeth. They take a long time to develop. Years of drinking coffee or tea, smoking, or even eating highly pigmented fruits such as raspberries, will cause the teeth to darken. These stains tend to be brownish or yellowish. They cannot be removed by any toothpaste, but they can easily be removed by bleaching. Here are before-and-after photographs of teeth that had these accumulated stains which were treated with the Kör deep bleaching system. Exogenous stains would be those that are caused by outside agents. All of the stains mentioned above would be exogenous. All can be removed by either a surface cleaning of the teeth or by bleaching. Endogenous stains are those that were acquired during the development of a tooth. Tetracycline stains would be in this category. If the antibiotic tetracycline is taken during the development of permanent teeth (between birth and twelve years old) it binds to the dentin of the tooth and becomes a deeply embedded stain. Fluorosis stains are more superficial but they are also developmental—they are caused by the consumption of too much fluoride while teeth are forming. From the point of view of a cosmetic dentist, you could also call a dark natural pigmentation in the teeth to be an endogenous stain. Some people’s teeth are just naturally dark. The treatment of these endogenous stains is different. 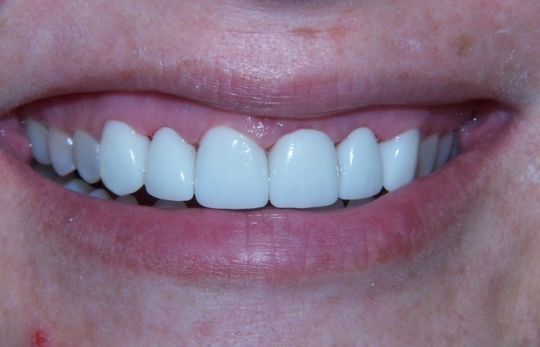 Tetracycline stains respond somewhat to bleaching, but are best treated by porcelain veneers. 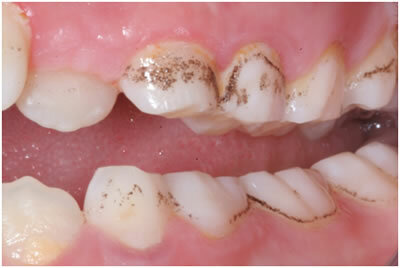 Fluorosis stains should not be treated by bleaching because they occur in splotches. However, the natural pigmentation of teeth can be treated effectively by bleaching. With persistent bleaching treatments, people can get their teeth whiter than they were when they first erupted into their mouths. I hope this is helpful. Good luck in your schooling. Thanks for your input. The cosmetic dentist is Dr. A (name withheld to help preserve Michele’s identity). He wants to charge me $42,000 for a full mouth of veneers (two teeth require crowns due to damage). The other dentist wants $26,000 for crowns. My budget cannot go over $30,000. Also, I forgot to mention that I grind my teeth at night and wear an appliance. I’ve read that veneers don’t stand up to grinding as well as crowns. I know the cosmetic dentist you went to, and he is really good. He would give you a stunning smile. I’m not surprised that his fees are high—he is worth it. About your grinding (also called bruxism). If you wear your nightguard, you should have no problem with your veneers. If you grind your teeth, you are actually at higher risk with crowns because then you don’t just chip off the edge—you break off the entire tooth. I had several patients who had to deal with that and you end up with implants later in life. Once you break off a front tooth at the gumline, if you’re a grinder, there isn’t a whole lot you can do with it. You see, with a crown you grind off a full millimeter of the tooth, all the way around. So if you have an upper lateral incisor that is 5 or 6 millimeters in diameter (let’s say 5.5 mm) at the gumline, then you grind down 1 mm all the way around, you now have 3.5 mm diameter. So you used to have a cross-sectional area of 95 square mm – now you have 38 square mm. So you now have 40 % of the strength left, when you’re talking about resistance to breaking off at the gumline. People who grind break these teeth off when they’ve been prepared for crowns. The lower teeth are even worse. You actually cut the strength of lower incisors down to about 1/4th of their original strength. 1. Do just the upper with Dr. A and do Kör Whitening on the lower. That way you get a stunning smile and cut the cost about in half. Kör, if you use it for long enough, will have a significant effect on the tetracycline stains and lighten them enough to be acceptable as lower teeth. Then at some later point, if you feel you need to improve the result even further, you could do the lower. I had a couple of cases of tetracycline stain that I treated where we did just the uppers and didn’t do anything to the lower. With most people, the lowers don’t show as much, especially if you are younger. And even when they do show, they are kind of in the shadows. 2. Check out Dr. B. He is in your city. I know him also, and he also does beautiful work and his fees might be within your budget. His work isn’t at the level of Dr. A, but it’s good. Call and find out what he charges per tooth for porcelain veneers. If that doesn’t work, you could find someone else that you could drive to see. I’m confident you could find someone who could do beautiful porcelain veneers and stay within your budget. Even if you needed to fly somewhere, if the fees were $15,000 less, it would be worth it. The interesting thing about the costs of cosmetic dentistry is that really the fees are pretty comparable for a good general dentist and a good cosmetic dentist (with the exception of exceptional artists like Dr. A). Should I get crowns to cover my tetracycline stains? I have severe tetracycline staining that I would like to get fixed. I’ve had consultations with a general dentist who wants to do a complete set of porcelain crowns and a cosmetic dentist who wants to do porcelain veneers (not Lumineers brand). I was quoted a price for veneers that is double the price of crowns. Can I achieve a great result with porcelain crowns or do I have to overspend my budget on the veneers in order to feel good about my smile? The general dentist has done one porcelain crown in my mouth already and I’m quite pleased with the result, although I know that a full set of these crowns will not look as real as the veneers which will have more variation in color to mimic real teeth. Please help me make the best decision regarding crowns vs. veneers. Thank you. You came to the right place! As I bring out in the website when I talk about tetracycline stains on teeth, this is a very difficult procedure and you absolutely need a talented and well-trained cosmetic dentist. There are so many things that could go wrong in your type of case. But to get a good result, you need to shift your thinking from thinking about the techniques being used to the artist behind the technique. The reason I would tell you to beware of the porcelain crowns is because of what that says about the dentist. Let me explain. Crowns are a very aggressive treatment, especially on front teeth. You have to grind away so much of the tooth that you weaken it and run a risk, when you are crowning all the front teeth, of snapping them off later in life. So why would a dentist suggest that when the more conservative porcelain veneers would do? Because he or she is uncomfortable doing porcelain veneers. The take-away here is that the dentist is not an artist. I think you already figured that out. I would absolutely not let him or her try to fix your tetracycline stains. Mediocre results would be the best you could hope for, and you run the risk of real trouble. And one problem you run into with the crowns is that if you need another dentist to come in later and re-do the case, you’re stuck with crowns. You can’t back-pedal to porcelain veneers. And I’m not impressed with your telling me that you are quite pleased with the one crown this dentist did. There are a lot of dentists who can do a great single crown. A smile makeover, especially when you have severe tetracycline stains, is in a completely different league. But this doesn’t mean I’m giving a green light to the other dentist. Is he or she a true cosmetic dentist or simply a dentist who claims to be a cosmetic dentist? This is the great peril the patient faces. Cosmetic dentistry is not a recognized specialty. All it takes to be a “cosmetic dentist” is a simple announcement–no extra training, no artistic talent. And you can’t judge them by the fees. Some poor ones charge high fees. Some terrific ones charge very reasonable fees. You didn’t share any numbers for the fees we are talking about, or any names of dentists. You may have more than two choices here. If you’d like to follow up with any additional questions, feel free to email me back. Tell me the fee and give me the name of the “cosmetic dentist,” and I could tell you more. You have the potential here of getting a really stunning smile if you do the right thing. Michele answers these last questions and I respond. Read the follow-up post: Crowns vs veneers for tetracycline-stained teeth. I got 8 porcelain veneers and 2 crowns 2 weeks ago. I am 48 and have tetracycline stained teeth. I am very disappointed in a few ways and don’t know what to do. First thing is that they are too white. I look silly. I am Italian with dark skin and I look like I have Chiclets in my mouth. My dentist gave me an option on the color so I realize I am stuck with that problem. I will probably not smile very often now. But the worst things are that I feel like they are loose and may come off at any time. I can’t bite down hard as it hurts in my molars. And also I can’t relax my teeth as it feels like the upper teeth are too long and my entire face aches like I am clenching and grinding my teeth. Help me with some advice please. I have had 5 kids with dental issues I always took care of. They are grown and gone and I finally was able to do my own smile. I am so sad about it. This is the sort of story have heard so much over the years, and is the reason I operate this website. 98 to 99% of dentists simply don’t know how to do beautiful cosmetic dentistry. They chose the field because they like to fix things, and they think like engineers, not like artists. You’re kind to take the responsibility for the color of your porcelain veneers. But there are about three things a dentist who is truly passionate about doing beautiful cosmetic dentistry would have done differently in your case. First of all, he or she would have been knowledgeable enough about the results you would get to predict how you would look when your case was done, and would have coached you to a more beautiful result. You’ve never had a smile makeover before – how are you supposed to know how a particular color will look once it is in your mouth? A truly artistic cosmetic dentist would be focused on creating a beautiful smile, and would steer you in that direction. Second, every excellent cosmetic dentist I have ever asked, and I have interviewed a number of them on this subject, has some method for making sure that you will love your new smile before it is ever bonded permanently. They will often make a set of what they call provisional veneers in acrylic that will be temporarily cemented onto your teeth so you can “test drive” the final result, to make sure that you will be happy. In addition to this, they have a try-in with the actual veneers – they will use a try-in paste to insert the porcelain veneers to let you see exactly how they will look. You will get as much time to look at this as you want – will get to see it under different lights, have a friend or family member come in to give you feedback on how it looks – whatever it takes to make sure that this will make you proud to smile before these are bonded on permanently. Most recently, I interviewed a cosmetic dentist in the Boston area that we recommend on this site. In 30 years, he has never had a patient who has not been happy with their new smile. If he ever did, he would re-do the case. And that brings me to the third thing an excellent cosmetic dentist would do. These dentists, as I said, are passionate about creating beautiful dental work. Most of them, if they heard you say what you just wrote to me – that you won’t be smiling much any more – would be so embarrassed that they would re-do the case for free. I had this happen to me. I was a young dentist and it was the first time I had done porcelain veneers on someone with tetracycline stains. When dentists are inexperienced with tetracycline stains, they will make one of two mistakes. These tetracycline-stained teeth are so dark on the inside that the color shows through most dental materials, and the dentist will have them made too translucent so that the gray-brown shows through. This is what I did. Or, they will make the teeth too opaque and white so that they look pasty and fake. This appears to be what your dentist did. Well, with the case that I did, after I gained more training and experience and knew better how to make this type of case look beautiful, I offered to the patient to re-do them for free, because I didn’t want work that I was responsible for not looking beautiful. The patient never complained, but I could tell she wasn’t excited about how they looked, and I wanted her to be excited. I’m not unique – that’s typical of artistic dentists who love to create beautiful smiles. So what do you do at this point? There really isn’t much remedy other than doing the porcelain veneers over. And this time you need to be very careful about the dentist you pick to do them. Pick one from our list – that’s why I have this website. I personally check every dentist I list to make sure they can do beautiful smile makeovers. But I need to say a word about how your mouth feels now. The porcelain veneers cannot be loose – if they were loose they would immediately fall off. But what I am worried about is that your teeth are getting loose. You say that your entire face aches, like you are clenching and grinding now. And you think that the upper teeth are too long. I can’t tell this from a distance, but it certainly sounds like your bite has been thrown off. This could potentially be very serious and could lead to serious TMJ disorder or breaking of the dental work, or premature wearing down of your teeth, or periodontitis leading to early tooth loss, or even breaking of your teeth. This could actually be the silver lining of your cloud, because this could give you grounds for asking this dentist to compensate you so you can have this re-done correctly. Here’s what I would suggest. Go to a dentist on our list of recommended dentists. See what he or she thinks of what has been done – if the work has indeed thrown your bite off to where it is causing serious problems. And then see if he or she will help you get some satisfaction from this other dentist. You need someone more than just a skilled cosmetic dentist – you need someone who will be understanding and willing to stick their neck out a little to help you get what you deserve. Opaque, bulky veneers from a dentist we recommended. Uh-oh! I had an e-mail exchange from one of our visitors. Her name is Robin, and I’m not even going to say the part of the country she is from, because of the sensitive nature of what I did and what I told her. You can read her initial question and my initial response on my post: A $30,000 cosmetic dentistry blunder. Thank you so much for responding to my question. I don’t do Facebook, but I would be happy to write a very positive review for you if you will tell me where to do it. The dentist who did my dental work is actually on your recommended list, although I did not find your site until after the work was completed. I will happily check out your other recommendations. Thank you for taking the time to help me. Yes. I want to be fair, so I’ll tell you that I sought a second opinion from a periodontist because [Dr. Unnamed] stated that the brown margins are visible due to gum recession. This did not make sense to me because my gums are in most excellent condition by all accounts. I am told this at every check up. The hygienists tell me with amazement that I have no bleeding and that my home care is excellent. [Dr. Undisclosed], a periodontist, confirmed this as she said “Wow. These are really good numbers.” She also said the veneers fit very well. Yes, I guess they fit well, but they look bulky, opaque and lifeless. I was so disappointed from the moment I first saw them. I don’t want to suggest that [Dr. Unnamed] is an incompetent dentist. He is just not an artist. I also saw [Dr. Anonymous – another cosmetic dentist we recommend in her state]. His opinion is that I should have them redone, as he thought they look lifeless. Generally, there are a lot of general criteria for whether or not I recommend a specific cosmetic dentist, and those criteria are lumped together, weighed, and I make a judgment call on the ability of the dentist. But there is one absolute, and that is that they have to listen and they can’t seat a case without the patient loving it. [Dr. Unnamed] has a lot of beautiful cases to show off. But an excellent cosmetic dentist will always try in a case and make sure it meets the patient’s expectations, and even if the patient doesn’t really object and the only clue to their dissatisfaction is the tone in their voice, I would expect the dentist to stop right there, find out why the patient is hesitating or not enthusiastic about the work, and send it back to the lab to fix whatever the issue is. If a dentist doesn’t do this, I don’t want to list them. Seating a case in the face of patient misgivings is a big “no-no.” I didn’t want to say this up front for fear you might be alarmed and out of niceness would then not tell me your complete, honest opinion. But I am going to pull his listing. I list these dentists with my personal recommendation, and it’s an embarrassment to me, a stain on my reputation, and a disservice to the patient to not have the dentist measure up to the expectations I create. About the gum recession and gum disease – recession is one thing and pockets and bleeding are another. You can have very healthy gums with no bleeding and still have recession. There is a way to tell if the upper front teeth are vulnerable to recession, and placing a case where the bone and the gums are healthy but thin can provoke recession if the dentist isn’t extremely careful. So maybe this is what happened if the margins weren’t showing when the case was first placed but they are showing now. I recently endured an all-porcelain full mouth restoration with crowns and veneers due to bruxism and tetracycline stains. The dark margins of the tetracycline-stained teeth are becoming visible. Also, I am unhappy with the bulky, opaque appearance. Do you know of an artistic dentist in [name of state] who is very experienced with the complexities of masking these stains while retaining the translucency of the natural tooth? cost you well into five figures. What a shame that it was done by a poor cosmetic dentist. But that’s the state of the profession. Any dentist can claim to be a cosmetic dentist, because the profession doesn’t require any special training or certification, but 98% of dentists could not do a decent smile makeover. Robin, one of the standards I have before I list any dentist on our website is that they would be able to do the type of work you want done and have it turn out beautiful. One of the basic differences between a dentist who takes appearance-related dentistry seriously and one who doesn’t, is what happens when the work is tried in and you finally get to see how this will look in real life. The vast majority of dentists will give you a quick look and say something like, “How’s it look? Good. Let’s hurry and put them in.” The excellent cosmetic dentist will actually want to know what you think of it, and if there is even a hesitation in your voice as you maybe say, “I guess it looks okay,” they will ask you what is wrong. “Why don’t you just love how it looks?” Every excellent cosmetic dentist will have that approach to their work. So you would be safe going to any dentist on our list. Thanks so much Dr. Hall. Yes, thanks to your website I selected a cosmetic dentist off your site in my area. He did a beautiful job. I had tetracycline staining and right now it does appear that it is covered. I keep worrying that it may still bleed through in time. Hopefully that isn’t the case. I guess if you’ve had these dark gray teeth all your life, it may be hard to believe that you finally, really have a beautiful smile, but I can assure you that the tetracycline stain is firmly attached to the dentin and will not move around and somehow surface again. Tetracycline stains do require an expert cosmetic dentist to treat. When poorly trained or inexperienced “cosmetic dentists” try to cover these tetracycline stains, they make one of two mistakes. Either they make the porcelain veneers too translucent and the dark color of the stains shows through, or they make them too opaque and the smile ends up looking pasty and fake. I’m glad to hear that your smile has turned out beautiful.